About a month ago, my husband and I whisked our kids away for a mini-vacation. We stayed in the Casitas (which were so nice and relaxing away from the main hotel) at Morongo, about an hour away from South Orange County. 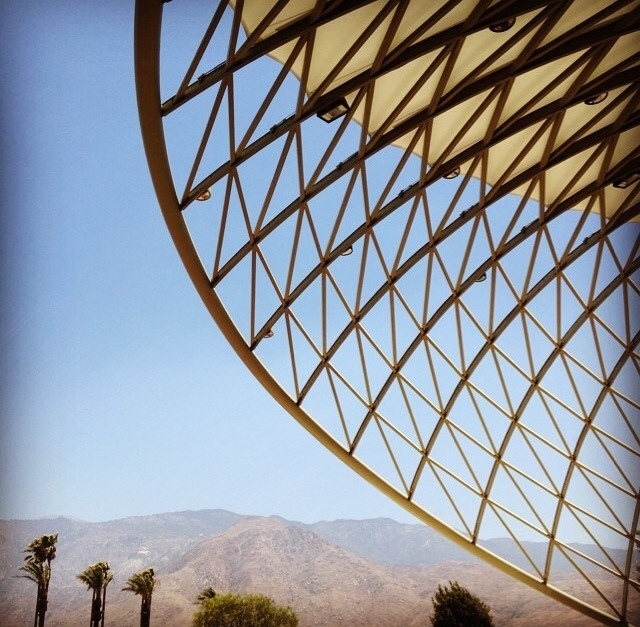 Morongo is about 30 minutes from Palm Springs, so it's desert weather and extremely tough on anyone's skin because of the dry 100+ degree heat and super strong winds (there are sand storms on the regular!). Luckily, before we left for Morongo, Neocell sent me a bunch of press samples, including this dry weather essential, "On the Go Moisture Complex: Refreshing Herbal Mist". Any moment my face felt hot and tight under the sun, or while walking through the strong winds to the main pool from our casitas, I'd spritz a couple pumps on my face and my skin felt immediately refreshed and less tight. After I came home from our little vacay, I liked to use a couple sprays after applying my ELF translucent powder. I love how the mist makes my makeup look ever so slightly more natural. I get that nice finish with just a bit of dewiness -- like I just got my makeup done and did a few jumping jacks. The Neocell spray contains rosemary, an ingredient that stood out to me. So, I did a little research on the benefits of including that particular essential oil in the Neocell face mist. Well, I found out that rosemary is widely used in aromatherapy for stimulating the brain, improving memory, and mental clarity (my mommy brain is definitely needing all of that). It is also used in the treatment of congested respiratory tract problems, stiff muscles, and boosting liver and gall bladder. So, not only does the Neocell face mist refresh, it has a bunch of other health benefits like treating stuffy noses and waking your brain up! Since, I started beauty blogging I have been introduced to so many wonderful products I would have never gone out of my way to try. I am a creature of habit, and would have been too shy to try face mists not knowing how my acne-prone skin would react. 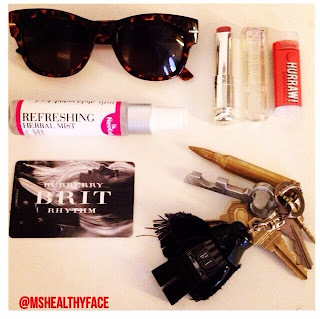 Thanks to Neocell, face mists are now an essential in my purse! Have you tried face mists? What are your favorites? What ingredients do you look for? Ingredients: Water, aloe barbadensis leaf juice, soluble collagen, rosemary (rosmarinus officinalis) extract, rosemary (rosmarinus officinalis) oil, polysorbate 20, horse chestnut (aesculus hippocastanum) seed extract, retinyl palmitate (vitamin A), tocopherol (vitamin E), inositol, calcium pantothenate, linoleic acid, biotin, calendula (calendula officinalis) flower extract, chamomile (anthemis nobilis) flower extract, linden (tilia cordata) extract, cornflower (centaurea cyanus) flower extract, matricaria (chamomilla recutita) flower extract, hypericum (hypericum perforatum) extract, butylene glycol, PEG-35 castor oil, phenoxyethanol, ethylhexylglycerin, sodium benzoate. Did you know it only takes 26 seconds for your blood stream to absorb what you apply topically? That is why it is important to think about what ingredients are in your skin care and other beauty products you apply topically. I came across Manomai when I first started beauty blogging, and truly became fascinated with their approach to skin care. I reached out to them, and they kindly agreed to send me a press sample to review for you guys. Manomai's founder is a believer in Dr. Peter D'Adamo's Blood-type Diet, which basically consists of eating the right foods for your blood type, in turn making you healthier and lose weight. She wanted a moisturizer that aligned with her beliefs in the Blood Type Diet, but also met her strict guidelines: pareben-free, mineral oil-free, fragrance free, cruelty-free, and artificial color free. So, she developed 4 moisturizers with 4 special blends to uniquely match each of the blood types -- the Around-the-Clock Facial Serum. Cool, right?! Manomai says each Blood Type group have different weakness when it comes to their skin. For instance, people with O Blood Type, like me, have typically "oily [skin] with larger pores. Type O's skin has an impressive ability to withstand the cold but the ability to protect itself from the sun is not very good. Compared to other blood types, Type O’s skin is more likely to dry up". (Pretty dead on! I hate my pores, and you guys know I always complain about being dry!) Therefore, to combat O Blood Type dryness, the Around the Clock Facial Serum for O Blood Types contains seaweed extract (Algae Extract) which is rich in vitamins, minerals, trace elements and amino acids to keep skin healthy and youthful. Although, the Around-the-Clock Facial serum is called a serum, it can be used alone or applied underneath your favorite moisturizer morning and night. To apply, I take two pumps of the serum in between my fingers to warm it up a bit. Then, I gently pat the serum onto my face with my fingertips like I discussed in my Serum 101 article. I let it dry for a couple minutes, and then I pat on my moisturizer. NO ADVERSE EFFECTS. The first thing I consider when I review any beauty product is whether the product caused any adverse skin effects like breakouts, rashes, itchiness, etc. 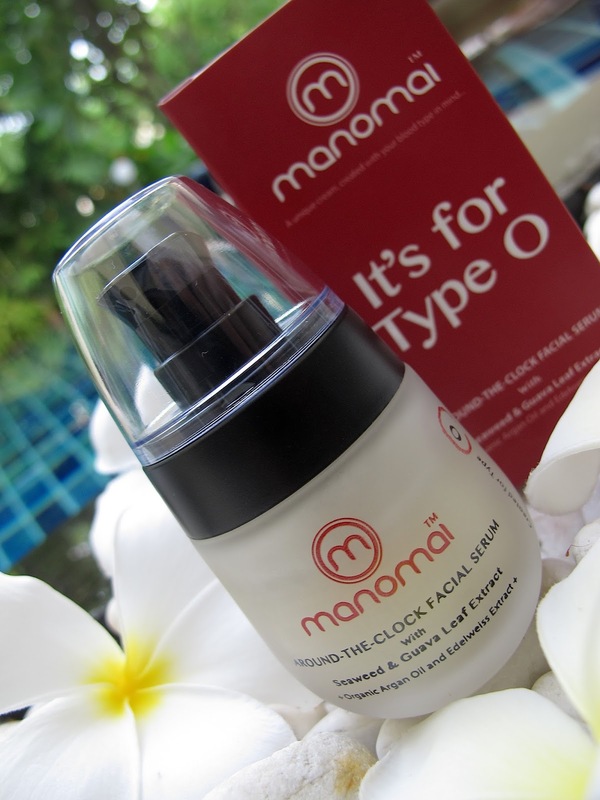 The Manomai Around-the-Clock Serum did not cause any breakouts or rashes. Despite its range in potent ingredients, it worked seamlessly with the skin products in my current routine, and I did not experience any interactions. is all I need for my entire face and neck. SUPER LIGHT. I like how light the Manomai serum feels on my skin. Manomai is based out of Thailand where it is very hot and humid. So, it totally makes sense that they create a moisturizer that is not heavy and can be worn comfortably in even the stickiest and sweatiest climate. FEELS LIKE SKIN. The Manomai formula is fluid and silky and doesn't make your skin tacky or greasy so it's great to wear by itself on those #barefaced days! 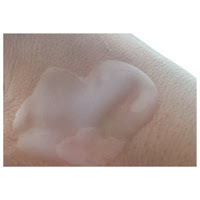 When it dries, it just feels like your own skin, but firmer and smoother. 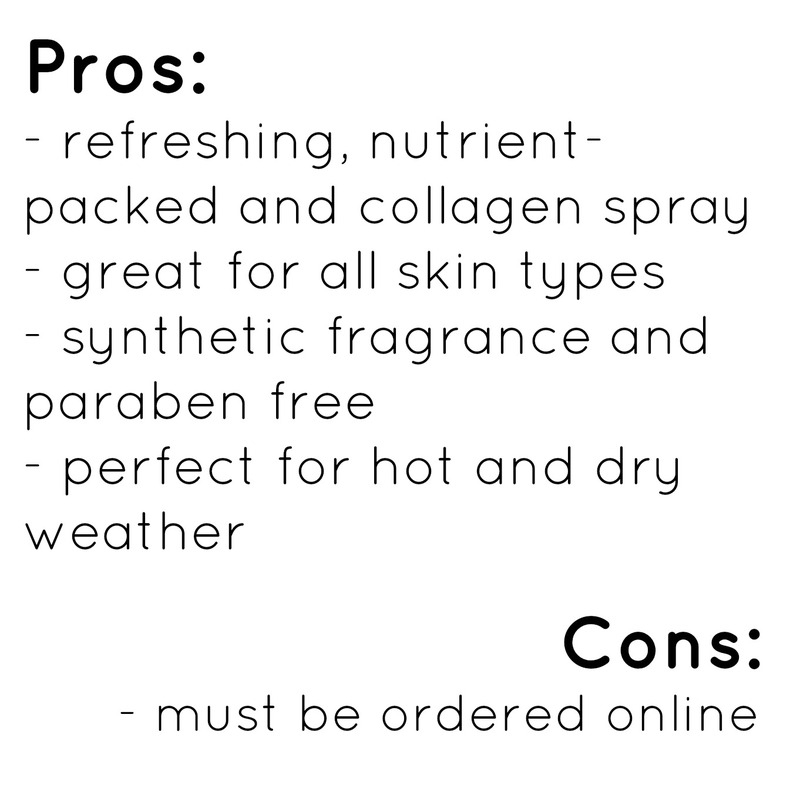 So, it's also perfect to layer under your moisturizer and SPF. NUTRIENT AND VITAMIN-RICH INGREDIENTS. Each formula is uniquely developed to target the ailments of each blood type group, but all are extremely well-rounded and nutrient-packed. For example, the O Blood Type formula contains a mouthful of potent extracts like seaweed, guava leaf, willow bark and cherry extract. It also contains jojoba oil and organic argan oil to promote cell regeneration, skin suppleness and elasticity, and prevent dryness. The Around-the-Clock formulas are superb, but the pump has room for improvement. The pump is a little stiff, but has a spring, so when you pump it almost splatters out. 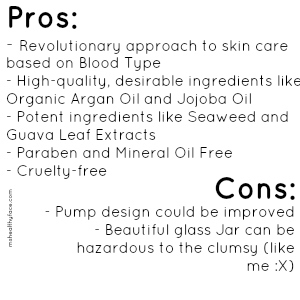 I would love to see the serum come with a smoother pump that allows for more control on how much you pump out. Secondly, the jar the serum comes in is this beautiful, frosted GLASS! 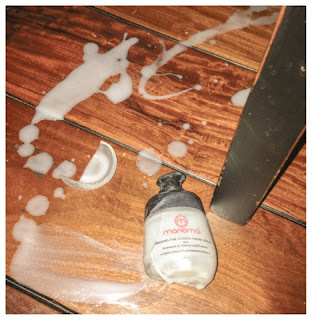 When I was going to take pictures and videos for this review, I dropped the serum onto my wood floor and the bottle broke. I am so heartbroken! All that wasted product!! I did my best to swipe up what I could and quickly slathered my arms and legs -- I did not want all that precious serum to go to waste.... :( I would love to see the serum come in a thick, luxurious plastic that can withstand a few drops every now and then. RECOMMENDED: All-in-all this is a high-quality moisturizer and serum that potentially will change the way we conceptualize skin care. For my O blood type, the Manomai Around-the-Clock serum agreed with my skin. It is a well-rounded serum that is chock full of beneficial nutrients that work to combat almost every skin ailment from dryness to fine lines. It has also been approved by the FDA-Thailand. 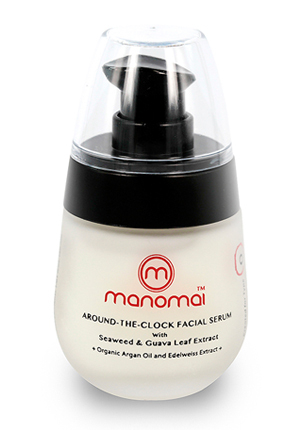 To purchase the Around-the-Clock Facial Serum visit Manomai.com. What do you think? Should we do away with the traditional normal, oily, combination skin categories, and evolve to blood typing skin care?